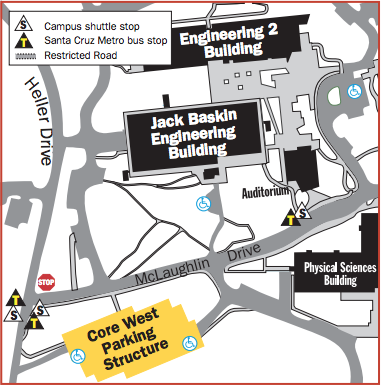 Effective 10/24/2016 the ISEE Offices have moved from the Center for Adaptive Optics to the Jack Baskin Engineering building on the UC Santa Cruz campus. The ISEE offices are rooms 131, 129, 127 and 125. Additionally, see the Campus Maps website for comprehensive maps of the entire campus. You will need A PARKING PERMIT, so stop at the kiosk on the right, just past the entrance, to purchase one ($6.00 per day). Turn right, out of the kiosk parking lot and proceed on Coolidge. Coolidge becomes McLaughlin Drive. You will need A PARKING PERMIT. Stop at the kiosk on the right, just past the entrance, to purchase one ($6.00 per day). Turn right, out of the kiosk parking lot and proceed on Coolidge. Coolidge becomes McLaughlin Drive. If the Kiosk is closed (after 1pm weekdays), drive 3/10 of a mile beyond the campus entrance. Drive past the Blacksmith Shop on the left, and take the next right turn. Turn immediately right again, and drive to the end of the roadway to the H Barn, park in one of the short-term spots and go inside. After purchasing your parking permit ($6.00), drive back to Coolidge and turn left (heading toward main entrance) and then make a right turn onto Empire Grade. Proceed on Empire to the West Campus Entrance, turning right on Heller Drive. Continue along Heller to 5th stop sign and turn right into the Core West parking garage entrance. DIRECTIONS TO BASKIN ENGINEERING (from CORE West parking structure): found HERE. The Baskin Engineering complex is located in the Science Hill area of the campus, near the intersection of McLaughlin and Heller Drives. It is best accessed from the West Entrance of the campus.